The Indian company Tata Technologies announced that it has entered into a Cooperation Agreement with Piaggio Aero Industries to collaborate on the development of the P180 Avanti II version MPA (Multirole Patrol Aircraft) through its joint venture with Hindustan Aeronautics Ltd (HAL), TATA HAL Technologies Ltd.
Tata Technologies will deliver a complete structural design and analysis solution for the aviation major’s new Multirole Patrol Aircraft (MPA). The Aircraft fuselage will be redesigned and optimized, the wings reinforced and modified to make the aircraft suitable to perform tasks such as surveillance and law enforcement. This will make it possible to increase the maximum take-off weight and introduce additional fuel tanks. Piaggio Aero’s Multirole Patrol Aircraft (MPA) is the evolution of the company’s P180 Avanti II multi-utility aircraft, which is newly designed to make it uniquely capable of surveillance, law enforcement and security missions. The MPA’s main features include an enhanced airframe, increased maximum take-off weight, additional fuel tanks and a new aerodynamic configuration and a reinforced wing providing an increased surface and higher aspect ratio. “Engineering the new MPA aircraft requires the ability to meet stringent weight targets in an aggressive timeline for design modifications. We believe Tata Technologies’ competency in aero-structures design coupled with close collaboration with our own engineers will ensure high quality and timely delivery” Mr Trombetta added. The new unmanned aircraft is called P.1HH Hammerhead. The P.1HH Hammerhead is an aircraft capable of automatic taking off and landing, and is positioned at the high end of this type of aircraft. Can reach the altiture of 13,700 meters with an endurance of over 16 hours. As the Piaggio Aero Mpa (Multirole patrol aircraft, presented in July 2012), also P.1HH Hammerhead unmanned aerial system is derived from the platform of the P.180 Avanti II redesigned with a new aerodynamic configuration, the greater extension wing (15.5 meters ) and a greater payload capacity. 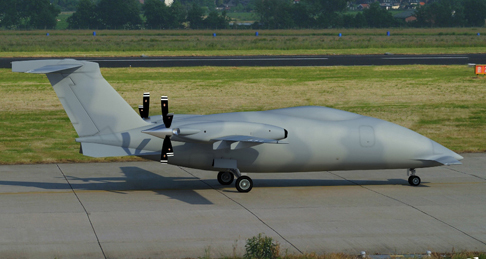 For avionics Piaggio Aero will develop new P.1HH in partnership with Selex Es, which will provide flight control systems and unmanned navigation and mission. Selex Es work with Piaggio Aero also for the integration of systems on board. The Tata group consists of 93 companies in seven business sectors and employs about 300,000 people, with annual revenue exceeding $ 100 billion. The subsidiary Tata Technologies has one-third stake in Piaggio Aero. The P180 was produced in about 220 copies and, with the new version, Piaggio seeks to acquire new markets. The aircraft would replace the old P166 that the Financial Police and Coast Guard use for maritime surveillance.